The Ariens Classic 21-inch Self-Propelled Straight Axle Walk Behind Lawn Mower provides professionally manicured results. The 3-in-1 system makes it easy for you to quickly transition from mulch to bag to side-discharge, and its powerful Kawasaki engine along with an impressive list of innovations are assured to provide years of reliable mowing. Recycler SmartStow 22-inch Self-Propelled Gas Lawn Mower with Briggs & Stratton Engine Recycler 22 in. SmartStow High Wheel Front Wheel Drive Variable Speed Self-Propelled Gas Lawn Mower with Briggs & Stratton Engine. For homeowners seeking a lawn mower with high quality, a user-friendly design and excellent mulching capability. Toro products are known for Smart Features and Proven Dependability. Count On It. 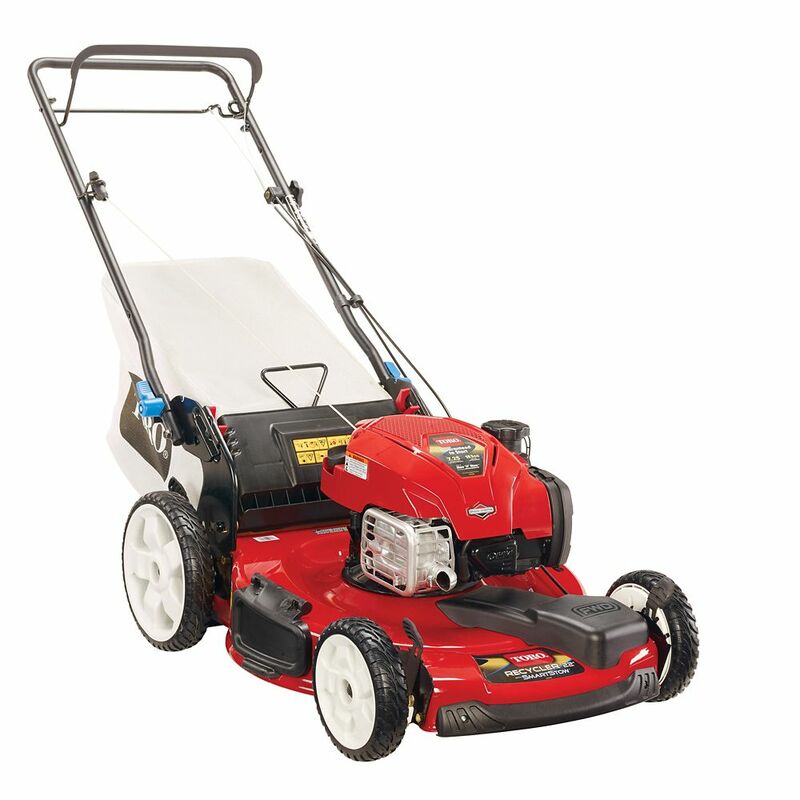 Recycler SmartStow 22-inch Self-Propelled Gas Lawn Mower with Briggs & Stratton Engine is rated 4.2 out of 5 by 2566. Rated 5 out of 5 by Donnie from Easy to start. My girlfriend loves it. Looking to use this for many years. Thank you for making a... Easy to start. My girlfriend loves it. Looking to use this for many years. Thank you for making a reliable product!!! Rated 5 out of 5 by Dave from This is the second Toro Recycler I have purchased. With... This is the second Toro Recycler I have purchased. With the first wearing out after many years, it didn't take much for me to decide on a second to replace it. Rated 5 out of 5 by HappyCamper from I purchased the Smart Stow due to my desire to save space in my garage. The mower came fully asse... I purchased the Smart Stow due to my desire to save space in my garage. The mower came fully assembled in the box. I opened the box, rolled out the mower, read the directions, unfolded the handle, put gas in it, put oil in it, pulled the starter, and it started right up. The cut was good. The front wheel drive has the disadvantage of being a little light in weight and the wheels do tend to spin in slick grass areas. However, with just a small amount of effort to pull the handlebar up, the increase in weight on the front wheels easily solves the problem. Additionally, I noted that I could more easily control this mower, versus a rear wheel drive or all wheel drive unit because I could rapidly push down on the handle and lift the front wheels off the ground when I needed to stop the mower or turn the mower. It had good power to pull the mower up an incline of 30 degrees. I stopped the mower several times. It restarted with little effort and always on the first pull. The pull to start is light and easy enough for any user. When I finished the mowing I simply pushed the mower into my garage, rapidly folded the handle and locked it into place. I then lifted the front end to the upright position. No leakage of gas or oil. Of course I had followed the directions and the fuel level was below the max level indicated for placing the mower on its end. The oil was full as indicated on the dipstick. No other problem noted either. It stays upright without any problem. Very stable in the upright position. The effort to lift the mower into the upright position was minimal at best. Should be easy for most anyone to do. So far so good. If the mower holds up over time, it will count as one of my best purchases to date on lawn equipment. I would definitely purchase it again based on my experience to date. Rated 4 out of 5 by Alice from I like the fact that the belt is enclosed were no grass clippings can accumulate under the belt/t... I like the fact that the belt is enclosed were no grass clippings can accumulate under the belt/transmission assembly cover. I like the fact that I can set it up to give the under deck a really good cleaning rather then use the deck wash all of the time. This mower has plenty of power which I really like and there were spots in my yard that was really tall. That is a real plus. After looking everything over and checking everything out this mower looks like it is made quite well and has an attractive look. I'm not sure if I like the "Starts Every Time" feature, but maybe after a few times starting my new mower I will get to liking it after using a manual choke for so many years. It will take some getting use to using the variable speed too since this is a totally different experience for me. It would be nice if this mower had a quick connect connector for the deck wash so we don't have to screw the hose in place each time. Does it require oil change or just top ups ? No oil changes for the life of the engine. Just check your oil level and add more oil if it gets low. Hope this help! Thank you. Does this model come with a rear bag or is that optional? Yes, it does. At least my one has included a rear bag. I believe I need to add gas before the 1st use. What type of gas does this mower use? Is regular Type 87 good enough? Do I have to add engine oil added before start? Thank You for your question. For best results, use only clean, fresh, unleaded gasoline with an octane rating of 87 or higher. Non-Ethanol fuel is best. Use fresh fuel less than 30 days old. To reduce starting problems, add fuel stabilizer to the fuel all season, mixing it with gasoline less than 30 days old. Do not mix oil with gas. The mower comes with a bottle of oil. You will need to fill the engine oil compartment with oil before using. on the overview for product code#20339, it says that there's no need for engine oil change for life. However, in the manual it specifies regular oil change intervals. Which one is true? Thank you for your question. This mower is powered by a Briggs &amp; Stratton 7.25 ft. lb. gross torque 163cc engine with ready start - no need to prime or choke, no oil changes for the life of the engine. SmartStow allows the mower to be stored vertically with no fuel or oil leaks. Check the engine-oil level and add oil as needed. Changing the engine oil is not required, but if you want to change the oil, use the procedure in the Operator's Manual. This may seem trivial, &nbsp;but why are all the pictures of this model showing a 190cc engine and then the specification say163cc. &nbsp; That is a significant difference....and the pictures are not the same as the rightful 190cc model???? its because they switched the lawn mower for this &quot;Father's Day Sale&quot;. Back the last week or two of May this $498 special was for the 190cc. Then a little bit into June, they changed the sale to a Father's Day promo and quietly changed the mower to the 163cc model. Leaving the price the same. They didn't change the photos though, which is why you see the 190cc model shown.